jihane 11 months, 3 weeks ago. failed thinking to re write in june or leave it for sep…. I never got a text either. Omg yey a really high pass! May I ask what mark you got? My first attempt, self study for 4days only. Passed with 53%. I’m so grateful to God. Not bad considering I couldn’t answer one of the section C questions! 65%. Pass))) Thank you. Opentuition is really useful. What was the pass % for F5? How did you re-revise? what did you focus on? 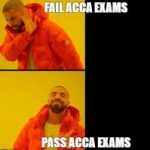 as the March exam proved, ACCA are way able to make a long question out of everything including transfer pricing, the 3 E’s, PV charts and all the other things that we tend to skip….